In our previous post, part one of our two part series titled “Welcome To Go-Green Windows & Doors”, we outlined a bit of what makes us unique as a door and window company. We are proud to offer expertise in foggy window repair and sealed unit replacement, and are happy to advise our prospective clients as to which option is best for them. 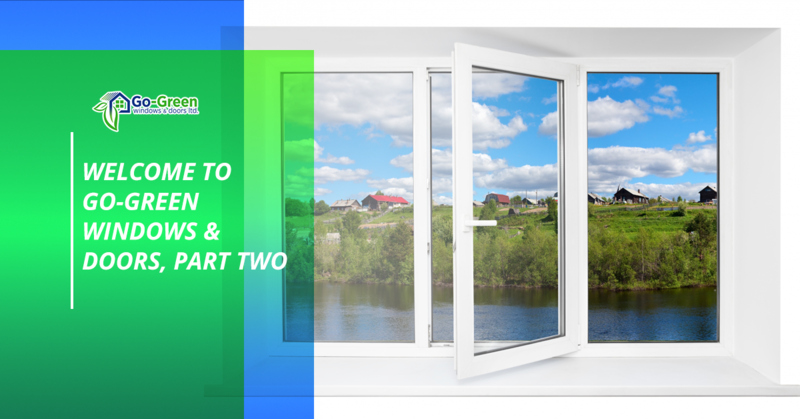 In part two of this series, we are going to highlight our window and door replacement and installation services. We offer a wide variety of options, each with their own customization capability. Remember that if you are interested in learning more about a specific project related to the cost, functionality, or really anything, we offer free quotes which include our experienced advice as to what best fits your home’s needs. Read on if you are considering glass window replacement or door installation. At times window repair isn’t an option, and your home or building in question requires a comprehensive sealed window replacement. Of all the window companies you could be choosing from, we believe Go-Green Windows & Doors is the best choice because of our affordability, maintenance-free and energy-efficient windows, high-quality and friendly staff, and exceptional level of service provided. With that in mind, we have a variety of choices when it comes to window replacement. Our frame material options include aluminum-clad, vinyl (PVC), or a combination of the two. Rest assured that if you aren’t sure which is the best option for you, our experts would be happy to offer their advice as part of the free quote service we are happy to provide. There are many types of windows that we can service and replace. Among these are casement, awning, picture, single hung, double hung, single slider, single tilt slider, double tilt slider, bay windows, bow windows, without forgetting custom shapes for any of our clients who have unique needs. The point is, we can get the job done effectively, regardless of the kind of windows you may have. If you are still on the fence about whether you should get a replacement window installation, consider these benefits of adding energy-efficient windows to your home. Reduction of heat and energy costs – not just in the winter, in the summer as well! Eliminate ultraviolet damage – coincides with the previous point, but you can keep your carpet from fading by 61 percent! What are you waiting for? Give us a call today to get started. Sliding Patio – get the feeling of opening up your home with expansive sliding patio windows to get more sunlight in. Our sliding patio doors can include options like internal blinds, grills, signature handles, and multi-point lock systems. Garden – These door types have a french-door look from the outside, but the distinction here is that one door acts as a vent, while the other is the door you can walk through. Garden doors have the added benefit of letting fresh air in while keeping dust and debris out. French or Terrace Doors – A sort of soft divider, french doors afford you the chance to blend interior and exterior living areas. We have many customizable features for all of these door types, so you are sure to not be getting a “cookie-cutter” door that everyone else on your block has. Even if we were to have a Calgary monopoly among door replacement providers, every home would be able to have their look, feel, and features that fit your needs. We hope that you have enjoyed part two of our breakdown of the many services we offer here at Go-Green Windows & Doors. We understand that you have choices when it comes to choosing a door or window installation company in the greater Calgary area. We believe that we have been able to be successful for close to fifteen years because we offer a unique combination of quality materials, knowledgeable staff, and a commitment to excellence in all that we do. If you are interested in shaving dollars off our energy bill and getting more comfortable in the process, get in touch with us at Go-Green Windows & Doors for your free quote today.